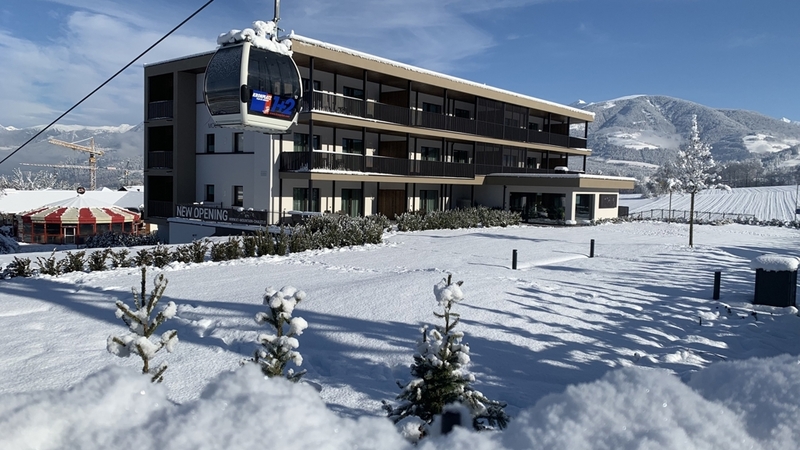 New, comfortable apartments with any comfort, directly at the ski run, in-house wellness area with various saunas, daily breakfast buffet and much more. Welcome to K1 Mountain Chalet****S in Reischach! Our K1 Mountain Chalet****S is located in Reischach, directly at the ski runs of Kronplatz ski area. The new apartments are the perfect starting point for unforgettable winter or summer holidays with the whole family. For our guests, we offer 13 new apartments of 5 different categories for 2-8 persons. The apartments are furnished in a modern and comfortable way. Each of them offers a living room with sofa bed and fully equipped kitchen with dishwasher, oven or microwave, induction stove and coffee machine, one ore more bedrooms with the highest sleeping comfort thanks to high-quality beds and matrasses, bathroom with, shower, WC, water basin and bidet, a balcony or terrace, satellite TV in the living room and in the bedrooms, a safe and free WLAN. Bed linen and towels are available. All apartments are accessible with an elevator. At K1 Mountain Chalet, your day will start with a rich breakfast buffet full with sweet and savoury delicacies. A spacious entrance and recreation area with reception and lounge is available too. For relaxing moments, we offer a wellness area with Finnish sauna, steam bath, herbal sauna, infrared cabin, ice fountain and adventure showers. At the vital bar with adjacent recreation room, you are offered drinks and small snacks. Also included in the price is the daily cleaning service of the apartments, a parking space in the garage and the use of the ski depot with private boxes and ski boot dryer. In the nearby K1 Restaurant with pizzeria, our guests are offered 5 % of discount. The ski rental service offers 10 %. Reischach and environs are a paradise for skiers and hikers. In the environs, you will also find a golf course and the worth-seeing city of Bruneck with museums, shops and restaurants. With Holidaypass Premium, you can enjoy numerous advantages and discounts, use all means of public transport in South Tyrol for free and participate at an interesting weekly activity programme. Modernly designed, romantic apartment with high-quality furnishings. Consisting of 1 bedroom with box spring double bed and flat TV; large bathroom with shower and bidet; open living room fully equipped kitchen, dining area, sofa bed, flat TV, as well as spacious terrace with outdoor furniture and private garden with view to Kronplatz. Sun-drenched apartment with high-quality furnishings. Consisting of 1 bedroom with box spring double bed, sofa bed and flat screen TV; 1 large bathroom with shower and bidet; open living room with fully equipped kitchen, dining area, sofa bed flat screen TV and balcony with panoramic view to the Pustertal valley. Luxurious apartment with high-quality furnishings. Consisting of 2 bedrooms with box spring double bed and flat TV as well as a large bathroom with shower and bidet; open living room with fully equipped kitchen, dining area, sofa bed, flat TV and spacious terrace with private whirlpool, outdoor furniture and view to Kronplatz. Comfortable apartment on the ground floor with high-quality furnishings. Consisting of 1 bedroom with box spring double bed, sofa bed, flat TV; 1 bedroom with box spring double bed, flat TV and private balcony; 2 bathrooms with shower and bidet; open living room with fully equipped kitchen, dining area, sofa bed, flat TV, spacious terrace with private whirlpool, outdoor furniture, large private garden and view to Kronplatz. Lovingly furnished apartment with high-quality furnishings. Consisting of 1 bedroom with box spring double bed, sofa bed, flat screen TV; 1 bedroom with box spring double bed, flat screen TV and private balcony; 2 bathrooms with shower and bidet; open living room with fully equipped kitchen, dining area, sofa bed, flat screen TV, spacious terrace with outdoor furniture and view to Kronplatz. Luxurious penthouse apartment with high-quality furnishings. Consisting of 1 bedroom with box spring double bed, sofa bed and flat screen TV; 1 large bathroom with shower and bidet; separate relax room with whirlpool, relaxation area, flat screen TV and balcony; private sauna, open plan living room with fully equipped kitchen, dining area, sofa bed, flat screen TV, spacious terrace with outdoor furniture and view to Kronplatz. Spacious family apartment with high-quality furnishings. Consisting of 2 bedrooms with box spring double bed and flat TV; 1 twin room with box spring beds and flat TV; each with its own balcony and 2 spacious bathrooms with shower and bidet; sun-drenched living room with fully equipped kitchen, dining area, sofa bed, flat TV and private terrace with outdoor furniture. This is a truly wonderful hotel. The staff could not have been more charming, friendly or genuinely helpful. They even allowed us to check in earlier and check out later, with no extra charge requested. The apartment was amazing, spacious, comfortable and cozy and very clean. A hot tub on the balcony was a big advantage, and perfect addon after whole day of skiing. What to say about sauna? Simply outstanding! A terrific and convenient location about 50 m from the ski lift! The breakfast buffet was really delicious, with a lots of food and cold ant hot drink selections. We more than highly recommend this wonderful hotel. My stay at this hotel was amazing. We come to ski opening and chose this hotel to stay because is very near ski tracks ( 50 m) The manager of hotel Verena and staff are so inviting and professional. It is also very close to the K1 restaurant and nightclub. The hotel also have beautiful wellnes and nice breakfast.I had an amazing weekend and I would recommend this place to anyone who is interested! For stays in the period from 23/04 to 05.05.2019 you will get an 10% Last-Minute-Discount. Skiers lodging 7 nights or more get 1 holiday and 1 ski day for free in the period 21.03.-19.04.2020!